He is survived by his sister, MaryAnn Smith, his brother, John, and many nephews and nieces. He was predeceased by his mother and father, Thomas and Selina, his brother Jim, and his sister Selina. After a few years in Puerto Rico, he was transferred to Las Matas de Farfán, Dominican Republic, on the Haitian frontier. It was a time of bloody persecutions by the Dominican dictator Rafael Trujillo. The Artibonito river between the Dominican Republic and Haiti ran red with the blood of thousands of Haitians who were butchered with machetes by Trujillo’s thugs. Father Forrest was fearless in confronting Trujillo’s soldiers, and after Trujillo’s assassination, Father returned to Puerto Rico. He was pastor of the Redemptorist parish in Fajardo, Puerto Rico, from 1967-72 and in Aguas Buenas from 1972-78. In 1971 he became involved in the charismatic renewal and turned the parish in Aguas Buenas into a worldwide center for the renewal. He bought a local motel and turned it into a retreat center, where he preached three weekend retreats every month to promote the renewal. In 1978 Father Forrest was elected director of the International Office for Catholic Charismatic Renewal. He served in that capacity, first with Cardinal Leo Jozef Suenens in Brussels and later in Rome, at the Vatican Congregation for the Clergy. 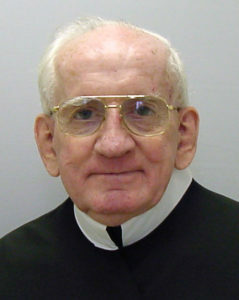 Father Kevin Moley, Father Forrest’s provincial both in Puerto Rico and in Brooklyn, called him, “one of the most outstanding evangelists of his time.” Father Forrest traveled to and preached in more than 120 countries, and his articles and books on evangelization and the charismatic renewal have been translated into many languages. He organized two worldwide retreats for priests in Rome, in 1984 and 1990. 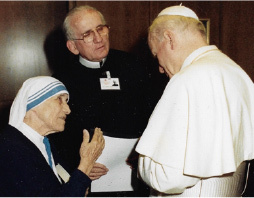 The first had the theme “a call to holiness”; the second was “called to evangelize.” One of the conferences on each retreat was given by his good friend, St. Theresa of Calcutta. The retreats began and ended with the Eucharist, and the main celebrant was St. John Paul II. More than 11,000 priests from around the world attended. He met with St. John Paul 30 times and dined with him eight times. Asked whether he ever dined with St. Theresa of Calcutta, he laughed because he said he never saw her eat, even though the two of them were at the dinner table together. She just talked and listened. He kept large leather-bound albums containing St. Theresa’s personal letters and Christmas cards. He also preserved cards from the Holy Father with notes from the papal secretary. At the time of Father Forrest’s death he was serving on a Roman committee planning for the second millennial of the Redemption in 2033. The viewing and funeral Mass for Father Forrest will be held at the Basilica of Our Lady of Perpetual Help, 526 59th St. Brooklyn, NY 11220, in the lower church (entrance on 5th Avenue). Viewing and wake, 3 to 6 and 7 to 9 p.m. Thursday, July 19. Viewing 9:30 to 10:15 a.m. Friday, July 20, followed by the funeral Mass at 10:30 a.m.
Burial will be at Resurrection Cemetery, 361 Sharrott Ave., Staten Island, NY 10309.